Would you like to be a Backdoor volunteer? Join our Guild! Backdoor Theatre is run almost exclusively by volunteers. Even if acting is not your thing, there is a place for you!! If you have ever had an interest in building sets, finding props, constructing costumes, working as an usher or helping with any of the hundreds of other projects needed to keep the theatre running, we want YOU! 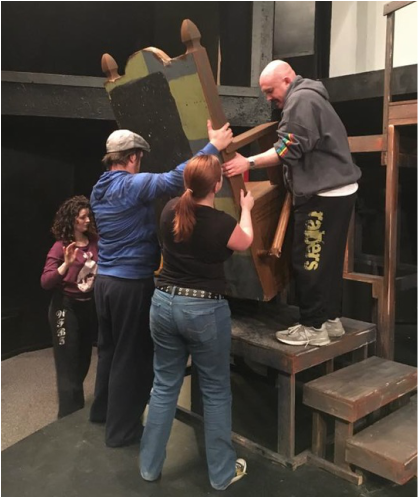 Every show needs a technical crew – lights, sound, painting, set construction, props, costumes, backstage help . . . the list is endless. Help with publicity - sell ads for the program, distribute flyers and posters to area locations and much more. Help with fund-raising activities - coordinate campaign materials, help organize an event, and more. Volunteer in the office – answer phones, take reservations, and help with office work. Contact our Guild President for more information. Already a member? Become a Gold member and receive a free Backdoor Guild t-shirt or become a Platinum member and receive a free personalized Backdoor Guild Polo! Upgrade today by clicking here, and thank you for your service!